I do hope this suggestion is not something on the do not say page like IRC scripting engine but I don't know what that is. I am using the iPhone app and I was wondering if there could ever be a xp tracker? There was 1 on the App Store but it was taken off yesterday and I can't find the reason but it was very helpful and it is much easier for me to check a iPhone app than the website which one is hosted already. not sure if you are aware but the armoury info is down and has been for a while all stats are 0 for evrything. Thanks for the report lilstuboi, we're looking into this as I write and will have a fix out at the earliest convenience. Once I tick it, the countdown starts, starting from 1 week. We have been discussing a wide verity of options. I was under the impression that we would have about a month for them to get it up and running however with the news of it coming tomorrow i guess we should get a bit of a move on. At this point you will be able to load the 07 servers straight away with SwiftKit just like any other web browser. As for hi scores and calcs that may take a few depending on how jagex work it. 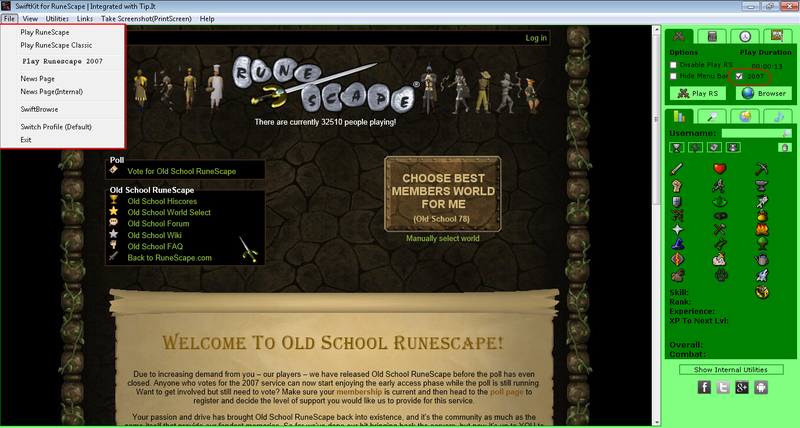 In the picture below you will see that I added "Play Runescape 2007" to the drop down menu. This can be linked with "oldschool.runescape.com" to display the page as shown in the screenshot. The toggle option on the right is to switch the highscores view from Eoc, to the oldschool runescape highscores without having to edit the link1 code in the link file. Let me know what you think, it seems like simple, easy changes that will make swiftkit viable for Runescape 2007. We plan on doing more or less exactly this, the link edit is a very temporary thing, our Lead Developer is away this weekend. We will have proper support soon. I suggest you make a whole new client for RS07. Call it Swift"Switch" like it used to be and have these image's, The exact way ot used to be. Would be very nostalgic, what do you think? A whole new client would take a lot of time, SwiftKit will bring more 07 support in future updates. While I get the whole nostalgic thing, I my self have run Old School RS inside SwiftSwitch but to be frank compare to SwiftKit it's crap. So we cant bring back world switching. Having the options inside Swiftkit In my opinion are better then bring back or spending all the time on recreating SS. We are working on this and and a lot more to do with old school rs, just heng tight we are attempting to solve a fairly major issue with jagex once this is solved every thing else should fall in place relatively quickly. Calcs will be in the next update, probably released tonight. Personally I think SwiftKit needs tabbed windows.. So when you open a Quick Link, it will open tabbed in the same frame as your current Runescape session, perhaps having a hot-key to snap back to the Runescape window? For those who prefer the pop-out windows, tabbing should merely be an option. with the integration of old school options, would it be possible for the quest centre to filter out all quests not applicable to old school?